Super Hero Boy: Dance baby dance! I have this weird fantasy... and bear with me on this one as either you will get it or you wont, regardless I personally think its hillarious. One of my absolutely favorite movies of all time growing up with Labyrinth and I remember saying from the first time I ever saw it, if I have a baby I am going to get him to dance to the Dance Magi Dance song... heh. So imagine my joy when I realized my son absolutely loves to dance. Actually from the moment he could pull himself up on furniture if he heard music he would start.. it originally started with just one little leg bopping to the music and these days he is a full on dancing machine. I tried to get a video of him dancing but sadly if he suspects I'm video taping him these days he immediately stops and runs towards the camera at full blast so instead I thought I'd share his very virst video of him dancing ever with you guys. It's a little long and you really have to watch but I promise you will see the famous one leg dance that he was known for in his baby days. These days Connor will dance at virtually any opportunity. When I saw the Playskool Dance Cam I knew we had to get one for Connor's christmas. You attach the Dance Cam to your TV and position the camera at an angle that points on your child. 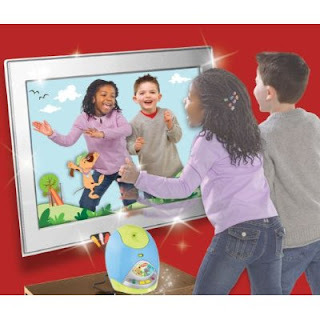 The Cam then projects your child directly onto the TV beside an animated character that dances along with your child. Connor does not quite understand that he is looking at himself (or I don't think he does) though he does enjoy watching himself dance on the screen so much so that he will sometimes stop to admire himself and then get a bit upset that the baby on the screen stopped dancing. heh. Though the toy is not recommended for children under 3 Connor and I have had fun with it though he does need to be closely supervised as he is always tempted to pull the Dance Cam down and I worry he will end up ripping it off the TV if I don't watch him. With that said for a three year old who loves to dance I could think of nothing better. The Dance Cam has several settings including dance along where the animated character sort of leads the dance moves and you can choose from quite a few diffrent songs or connect your MP3 player to add your own songs. There is also a Cool Mooves mode that is perfect for older kids that teaches them some new dance moves. Thus far we mostly use the Freestyle mode and use our own songs via our mp3 player. You can pick up your own Playskool Dance Cam at most major retailers or get your own on Amazon!